Our cat is called Chaos because she brought chaos into our lives ... I got her from a friend, she was dirty and so full of flies it was unreal. I stayed up all night bathing and picking them off of her and when I was done I was surprised to find a cream kitten under all the dirt, the bluest eyes too. She is a red point Siamese she loves to cuddle and eat and has the biggest personality in the world. My older cat Hotrod is in love with her just as much as we are, she got her name because when we first met it was total chaos but love at first sight. Chaos has a fascination with our rabbit, I let my 15lbs bunny out and she is all over him trying to bite his ears and get him to run. He never obliges her, she will often climb in his hutch and pass out with him, both curled up together. He does play with her when he's in the mood he'll chase her around the house. All you see is two white blurs running! Love reading all the stories. So sweet. 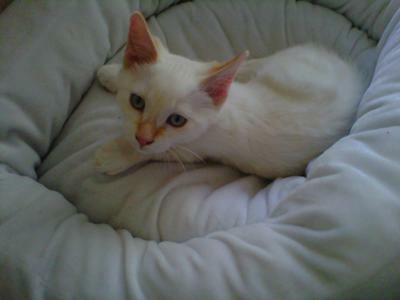 I want to adopt a Siamese flame point but wondering what is the experience of anyone with allergies to cats with Siamese flame point. They say usually Siamese and Siberian are low on allergen or hypoallergenic, but wanted to hear personal experiences. Thanks. Note from Caroline: I have heard this too but I don't think that Siamese cats are necessarily lower in allergens than any other short-haired cats. Some may be, but you'd have to experiment to really know the answer. What a cutie. I never would of been introduced to the flame point if not for my daughter finding a two-day-old left on the street. Of course we took it in and we learned how to bottle feed him, burp him, and ofc potty train him. I grew so attached to his personality. He was diagnosed with liver failure and I was told to put him to sleep. This was not a option for me. I was going to love and care for him until he didn't recognize me any more. I studied medicines on the internet and found one that actually worked. Our Bubba managed to survive eight more months with us until he went outside one night and got hit by a car. This has been over three years now and I am still grieving over him. I did eventually get another flame point and he is the love of my life. He follows me everywhere and is constantly talking to me. Just great personalities, these cats have. Amber emailed me to say they'd bought a new bed for Chaos, and sent me a picture of it, too. Bugzzy the mobster rabbit. You gotta love that! So Chaos has turned out to be a boy? How funny. And in that case I think he's even better named! His name is Bugzzy the mobster he will sit under the table and wait for Hotrod to come down and go after him. Its funny because he doesn't know where he is and the second Hotrod shows he's all over him. Chaos we just found out was a boy - funny thing is his peanuts have not come out yet but with all of them together its added more in to our life. We love our animals with all our hearts. That is a great name - and I can really appreciate why you call her that!! lol!! Our Saffy is in to everything!! She is not phased by noises or sticky stuff ... so jumps where she shouldn't and knocks things down and over just for the fun of it!!! Hi Amber and thank you for your two messages which you can see above - you'll see that I've put them both on the same page as I felt that together they made a great story. I love your cats' names - Chaos and Hotrod are both wonderful names for cats - especially Chaos, which is what Siamese cats and kittens usually bring with them! Now I'm wondering what your rabbit's name is? Does he have a great name too?